This weeks Monday Motivational Poster on Growth Mindset Success and Hard Work go hand in hand. There is no elevator to success. You have to take the stairs. This is a quote by Zig Ziglar. As educators we know that true success is not our students test scores or reading levels. Information gleamed from test scores are not the whole measure of who our students are or who they will be. Many believe that outside factors influence how successful an individual can be. But we know in the end hard work and a the right attitude will win each and every time. We can help our students navigate all of the outside influences by helping them set small goals. I like to equate each small step to climbing a set of stairs. The set of stairs will look different for each student. Therefore, teachers can share that once the landing is reached to celebrate that goal. As each step is gained it sets in their mind that they can succeed. It is important that students understand success comes by trial and error. Even when we don’t get it right the first time we will if we continue at it. This week’s book suggestion fits right in with the theme! Luke Goes to Bat by Rachel Isadora is a book about a boy who loves baseball and often has to sit and watch his brother and his friends play. The other kids just don’t think he is good enough to play on their team. One day he gets the chance to be on the team and strikes out! As a result, he feels defeated. One day his Grandmother surprises him with tickets to his favorite baseball team’s game! Through a twist of events he is encouraged by his hero Jackie Robinson to not give up and to get back at it! 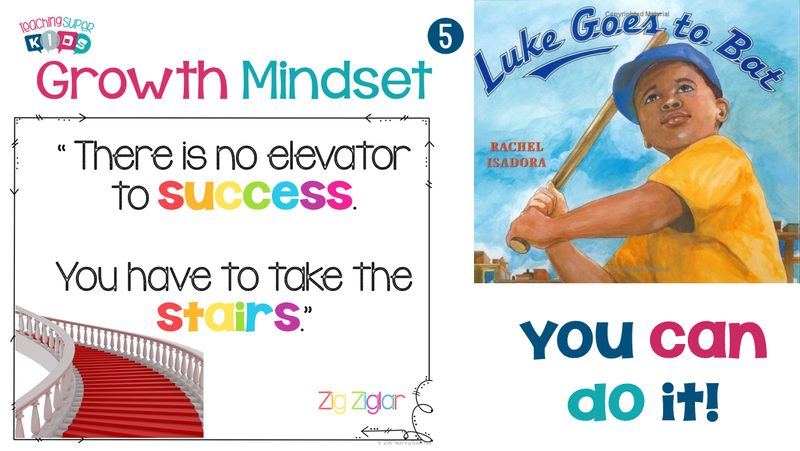 Click on the image below to download this weeks Growth Mindset poster on success and hard work!